Center for Council offers a variety of tailored services and programs for groups or organizations. Introduce the practice of Council to your staff, board, community or project and explore the context, impact and practical application of integrating Council practice and the potential it holds to improve communication, deepen relationships, build trust and reinforce intentions for groups of any size or composition. Our senior staff is available to help assess and facilitate exploration of the underlying conditions, potential impact and practical implications of working with Council and can advise and consult on the introduction and expansion of a Council program for your business or community. We provide tailored support for the integration of Council to help shift organizational culture, increase mindfulness, deepen community, and build a greater mission-driven focus for ongoing groups and project-oriented teams. Center for Council has played a critical role in a series of interfaith "Bearing Witness Retreat" programs offered through Zen Peacemakers. At each of these international events, Center for Council offers training, coordination, support and consultation in integrating Council practice. Daily small-group Councils are offered, led by trained facilitators, and public trainings and seminars in Council are often available. In 2014, at the invitation of Bernie Glassman and the Zen Peacemakers, Center for Council was invited to Kigali to work with a group of peaceworkers committed to healing their country. Fourteen participants form local NGOs were to participate in the upcoming Bearing Witness Retreat, offered as part of Rwanda’s commemoration of The 1994 Genocide Against the Tutsis. Rwandans are deeply engaged in a healing process that impacts the entire population, including the generation born in the post-trauma period and very much touched by it; NGOs are profoundly aware of the challenges of reintegrating the perpetrators of genocide, many of whom have served twenty-year sentences and are approaching the end of their punishment, ready to return to the communities in which the crimes were committed. The modality of Council offered an invitation to go beyond attachment to "knowing who is who," beyond what one might think about another member of the circle who might hail from a different background, and how it might be to set aside all we believe we know in order to be truly present with the emerging moment. The potential for acknowledging all that we are and all that we might become together offered a unique opportunity to NGO staffers looking for ways to support the country's new "One Rwanda" initiative. The retreat was a weaving of Rwandans, Europeans and Americans and proved to be a profound and impactful experience for all involved. Council played an important role in each day, providing a container for listening deeply to incomprehensible grief and suffering and speaking authentically about its impact on participants. The Rwandan team was so moved by what they observed to be the power of the Council process that they worked to create their own new organization, the Rwanda Center for Council, which was later recognized by the Rwandan Governance Board as an official NGO. 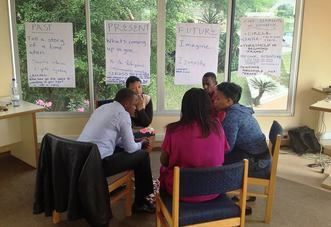 Using a Council-based program model, inspired by that being developed in California prisons, and in collaboration with the Rwanda Correctional Service, this organization plans to introduce and support Council practice inside the Rwandan prisons — in addition to providing support and coaching to a growing network of community-based organizations throughout Rwandan civil society. Center for Council went on to co-host a follow-up conference on the work begun at the retreat at the invitation of the Rockefeller Foundation, which took place at Rockefeller's Bellagio Center, on Lake Como. That conference brought together US and Rwandan representatives from government, academia, mental health and NGOs working in the area of corrections and offender rehabilitation, in collaboration with experts in trauma resiliency and the practice of Council, for extensive dialogue and planning. ​Read more about the work in Rwanda. ​The Zen Peacemakers have hosted Bearing Witness Retreats at the site of the concentration camps of Auschwitz-Birkenau in Oświęcim, Poland, for over twenty years. These events have continued annually and are multi-faith and multinational in character, with a strong focus on the Zen Peacemakers’ Three Tenets: Not-Knowing, Bearing Witness, and Taking Compassionate Action. Participants include the children and grandchildren of survivors of the camps, as well as decedents of the Nazi guards and officers. These retreats include Council as a foundational practice throughout the program. Each day begins with a small group Council, followed by sitting by the train tracks at Birkenau, bearing witness in silence, as well as reciting the names of the dead. Participants walk through the vast camps, performs vigils and memorial services -- on the selection platform, inside the women’s, men’s and children’s barracks, the crematorium, the ash pond -- and hear presentations and meet scholars and witnesses who shed light on the place and its history. The whole group meets in the evenings for various programs to continue bear witness to oneness in diversity, often engaging in large spiral Councils. Before and after the retreat, Center for Council generally offers a Council workshop to the public, then hosts a professional development session for the trained facilitators who lead the small groups throughout the retreat. Daily facilitator supervision sessions are also included for those who are leading councils with participants and resources are available for those who need additional support. Turning toward suffering can take many forms. As a practice, it can seem counterintuitive as a strategy for addressing trauma and, to be wholesome, it demands skillful means, deep fortitude and compassion. The suffering of the Bosnian people is deep and profound and the horrific events of the 1990s are still tender and uncomfortable. Even now, excruciating memories are triggered by certain sites, uncorked stories, even turns of phrase. Despite the notorious “Bosnian humor,” an off-color and surprising proclivity for diffusing tension with dark jokes, there seems to be a longing for a real encounter with our common experience of suffering. So much there has gone unaddressed, unrestored, unmet… and a deep and embodied experience of coming together to grieve, release, celebrate feels emergent. Zen Peacemakers sponsored a 4-day Council Training with an assortment of peaceworkers engaged in the complex and challenging work of rebuilding, coordinated by Vahidin Omanovic and Mevludin Rahmanovic, two dynamic local Imams who have created the Center for Peacebuilding (CIM), based in Saski Most, BiH. Their inspiring work is devoted to fostering reconciliation between Bosniaks, Serbs and Croats. 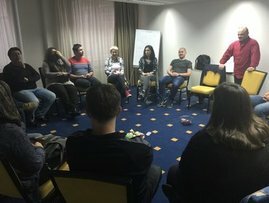 The Council Training offered was deep and intense and set the stage for a Bearing Witness Retreat to follow in which these Peacemakers would work with other Europeans trained in Council to facilitate daily Council circles for several dozen participants. See Zen Peacemakers' website for more details. Read participant testimonies and an article by Director Jared Seide.